How many times have you scribbled something (un)knowingly on the wall, fabric, plastic and various other surfaces, not to forget your skin, with a permanent marker? We’re sure at least once in your lifetime. 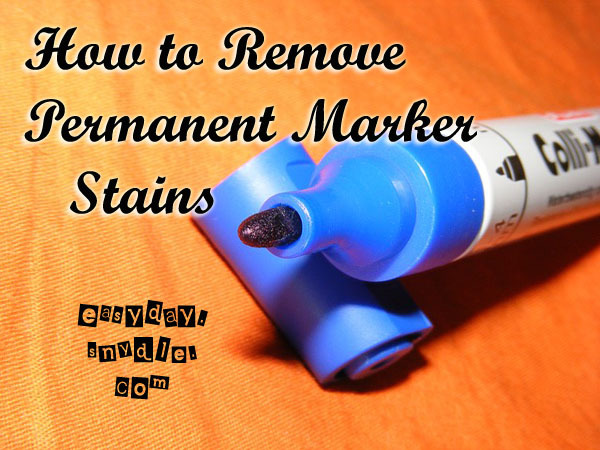 Yes, we’ve all had that moment when no matter how hard we tried to get rid of the stains (before our mothers found out), our efforts were wasted because a permanent marker does just what its name suggests – mark permanently. In dire situations, what would you do? Wash it with a detergent or use a nail enamel remover? Where, at times, these solutions do work, but you can’t always count on them to bail you out. So, for all those desperate to get the permanent marker stains off of any possible surface, read on. 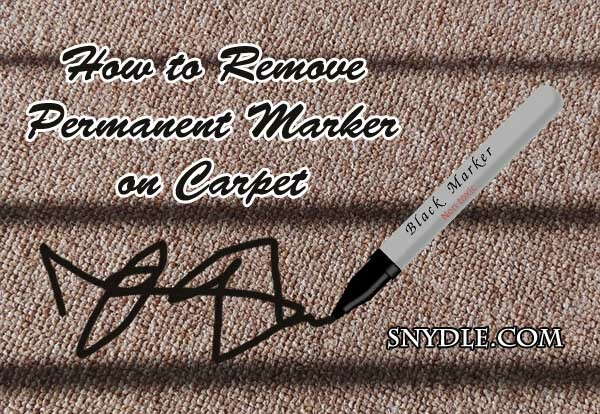 Here are some ways on how to remove permanent marker from any type of surface, be it on your wall, carpet or even on your skin! Oh the dreaded marker stains on the skin! Whether it’s your little one’s innocent face and hands painted with a permanent marker or your own (after a drunken night out? Just saying! ), it is very likely that regular face wash and/or soap won’t come to your rescue. 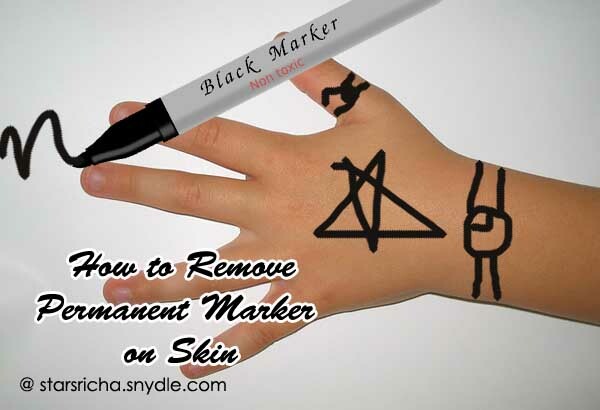 Instead, try this trick the next time you are faced with the dilemma of getting rid of the marker stains off your skin. For sensitive skin – Take some baby oil and pour it on a piece of soft cloth and rub the marked area with it. Considering the sensitivity of the skin, you don’t want to rub the cloth too harshly. Be gentle enough that it doesn’t cause any redness on the skin. For normal skin – For those of you who can bear lingering strong smell, then rubbing alcohol is the answer for you. Anything that has a higher percentage of alcohol in it, will work wonders in getting rid of the stains for good. Take a cotton ball or a soft cloth, dip it in alcohol and rub the surface of the marked skin with it. These techniques may not get rid of the stains completely, but for the most part, it’s going to come right off. All you need to remove marker stains from plastic are a hand sanitizer and a tissue. Put a coin sized drop of the hand sanitizer on the tissue and rub it on to the plastic surface that needs to be cleaned of the stains. In case the surface is very bumpy, it may take more tries than expected. Otherwise, if the surface is smooth, the marker stains come off pretty neatly. For those of you who can’t readily find rubbing alcohol, worry not, for there’s another alternative to it – a deodorant spray, specifically Axe deo spray. Yes, you read that right! All you have to do is spray the marked surface with Axe deodorant spray and wipe it off with a tissue and you should be good to go. For wooden surfaces, just like plastic surfaces, it is pretty easy to take sharpie stains off of them. Using a cologne or deo spray works. The moment you spray, the ink should start bleeding out and you can easily clean it with a tissue. Apart from that, a non-gel based tooth-paste works equally well. All you have to do is rub some tooth-paste on the marked area on the wood and wipe it off with a clean tissue or a piece of cloth. And your wooden furniture is as good as new. A word of precaution – Using a cologne or deodorant spray on wooden furniture can, at times, ruin the finish of the wood. So it is always advisable to first experiment removing the marker stains from a hidden surface of the wood and if it causes no harm to its finish, then you may as well carry on using it where the stains really are. Have you ever felt that no matter how desperately you try to keep the kids away from certain things, they always unknowingly end up playing or experimenting with those same things? What would you do if you found out that amidst all those experiments your sofa fabric got sacrificed with stains from a permanent marker? Freak out? Well, yes, that’s precisely what anyone would do. But worry not, for we have a solution to fix those adamant stains. Just to make sure this fix doesn’t ruin the fabric, just test it on a safe spot first. Spray the portion of the sofa or fabric that got sacrificed with water to get it nice and wet. Now, take a little bit of baking soda and rub it on the surface of the fabric that needs to be cleaned. Better still, take a scrubbing brush, put some baking soda on it and rub the surface of the fabric until the stain comes off. Let it dry and voila! No more freaking out. Something that works without fail in getting the stains off clothes is a hairspray. First off, you might have to dampen the stains a bit with water. Now, take a paper towel and spray some hairspray on it and gently blot it on to the damp part of the clothing where the stains are. You should start to see the ink from the permanent marker come off. 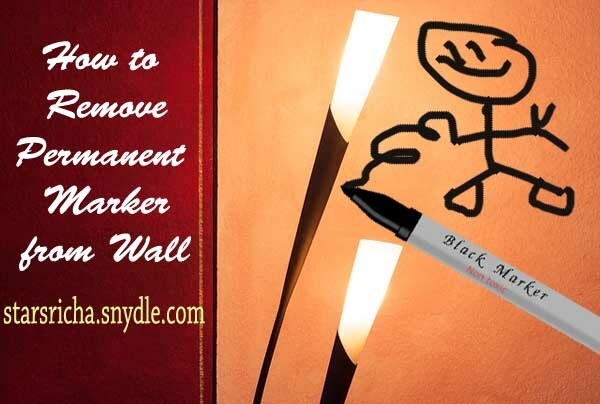 So, your kids designed your walls with murals with a permanent marker? Oh, the hidden designer in them! Can you ever get enough of their talent? Well, considering your walls got ruined, I think it’s safe to say that you can! Talking about murals on your white wall, here’s what you can do to make them disappear (regardless of how cute the murals look). Take some non-gel based white toothpaste in a small container and mix it with some water. Add enough water so that it can be easily rubbed on the wall. Let it sit there for a three to four minutes and scrub it off using a brush. And, that’s pretty much it. You should see the results for yourself. Nothing works better in removing permanent marker stains from a leather surface than a hairspray. Not a lot of efforts go into this trick. Simply spray the leather surface with hairspray and wipe it off with a cotton roll or a clean tissue. It’s as simple as that. However, if that doesn’t work then try using a rubbing alcohol. It works wonders every time. So whether it is a leather bag, a chair, a couch, a jacket… the possibilities are endless, you now know how to break the leather and permanent marker union, because some things are just not meant to be, right? With all the possible surfaces covered, you won’t nearly have an anxiety attack the next time you see a spot permanently marked. You’ll know what you’ll have to do. Now, that’s one thing off your worry list. Good luck on others, though! Have you ever tried anything other than the tips mentioned above for various surfaces? What did and didn’t work for you?